Check out the December 10th issue of Beatles Magazine, which features a spotlight look at Veronika Carnaby's Bohemia. 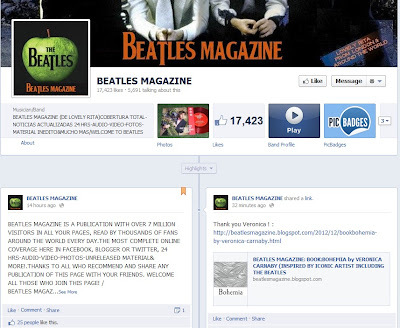 The magazine, as stated in their introductory description, reaches a worldwide readership of "over 7 million" with their daily stream of updates relating to The Fab Four. Within the feature, the author explains the role that The Beatles played in the creation of the book and an interesting turn of events involving Sir Paul McCartney months before the novel's publication. Visit the the Beatles Magazine web page or Facebook page to read the feature along with a personal note from Veronika Carnaby herself. Bohemia gets my hearty endorsement. Great job on capturing the spirit of 1960. A review of Bohemia appears at my blog today.